Ukraine is either in or on the verge of civil war depending on your definition. This conflict is one of many human disasters unfolding in the 15 countries of the former Soviet Union. When the USSR collapsed, politicians and media commentators throughout what we then called the ‘free world’ celebrated the disintegration of the Evil Empire as signaling the fall of a ‘totalitarian’ regime, an event of liberation equivalent to the fall of fascism 45 years earlier. Now, 25 years later, events should prompt a reconsideration of the end of the Soviet Union, especially because the possible disintegration of Ukraine is but one of many political and economic crises among the ex-Soviet republics. In a previous article in oDR I showed that per capita income in Ukraine today remains 20 percent below what it was in 1990 when the country was a republic of the Soviet Union – not a signal of success. Four other ex-republics share this unenviable characteristic: Georgia, Kyrgyzstan, Moldova and Tajikistan. The five account for a quarter of the current population of the ex-Soviet republics, and almost half of the population if we exclude Russia itself. The percentage of households with incomes below the level of 1990 is considerably larger because of the increases in inequality in all 15 countries, with the increase most extreme in Russia. But this only hints at the fall in living standards. In most of these countries the public health system, with universal coverage of a high standard previously available in Soviet times, has collapsed. Ten years ago I contracted a chest infection while working in Moldova, and discovered the full meaning of a ‘two-tiered health system.’ At 5:30 in the evening I was taken to a nominally public hospital, and hurried past approximately fifty people lining a hall waiting to see the only doctor on duty. After seeing the doctor and getting an X-ray I was presented with a bill for US$ 5, trivial to me but far more than the waiting Moldovans could afford. To ensure that the guilt of that doctor's visit would never leave my memory, I learned that I had been the doctor's last patient that day. Those waiting, some of whom had come considerable distances, would have to come back the next day. The ‘lowest year’ (red bar) refers to the year when per capita income reached its lowest point. For most of the countries this was during 1993-1995, though later for some (e.g. Moldova). Black bars are the value in 2012 compared to 1990. Estonia is omitted because of a lack of statistics for 1990-1994. World Bank, World Development Indicators 2014. Just the raw numbers of per capita income are bad enough. Just the raw numbers of per capita income are bad enough, as the chart shows. Every country in the chart, 14 of the 15 (Estonia omitted due to lack of statistics) suffered a post-Soviet decline of at least 25% (Uzbekistan at minus 27% the smallest decline), and eight at least 50% (Armenia, Azerbaijan, Georgia, Kyrgyz Republic, Moldova, Tajikistan, Turkmenistan and Ukraine). The reality of a fall in household income of that magnitude, combined with a near-complete loss of access to health care, defies imagination. It goes far in explaining, for example, the estimate that close to 40% of Moldovan females aged 15-35 worked as prostitutes in EU countries in the 1990s, and entire villages survived by young men drawing lots to have organs removed for the illegal trade in medical transplants (see the 2005 UNDP report on Moldova that I supervised). A further sobering revelation from the diagram is to note that the eight countries with increases in per capita income include the most oppressive post-Soviet dictatorships, for example, Azerbaijan and Uzbekistan (both countries in which I also worked, for the Asian Development Bank and United Nations Development Programme). Evidence that per capita income only hints at the full tragedy of the ex-Soviet Republics appears in the table below, which gives annual deaths per 1000 people, the crude death rate (CDR). It reports the CDR for 2012, and the percentage change compared to 1990, and the highest (worst) rate reached after 1990. Of the 15 countries, in only six is the CDR lower than it was in 1990, and in three it is over 20 percent higher; and in several of the countries, the current CDR is not substantially different than its highest post-1990 value. To put this in perspective, there is no country in Africa with a higher CDR in 2012 than 1990. To put this in perspective, there is no country in Africa with a higher CDR in 2012 than 1990. The elites of the ‘free world’ and their financial institutions – the IMF, World Bank, the Asian Development Bank, and European Bank for Reconstruction and Development – can claim much of the credit for poverty and early death in the former USSR (see, for example, my research article on poverty in Moldova). ‘Highest’ refers to the largest annual value, in most cases during 1993-1995. 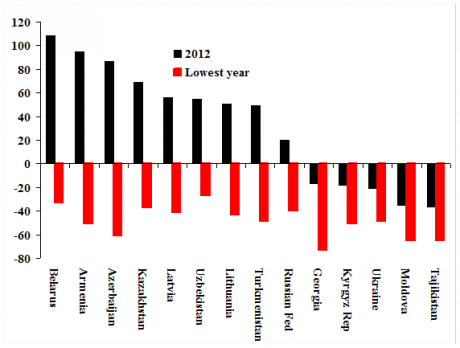 The table should be read as follows: for Uzbekistan the Crude Death Rate was 4.9 per 1000 people in 2012, which was 22% lower than 1990, while the highest rate during 1990-2012, was 8% above 1990. One should not judge the collapse of the Soviet Union only on the basis of incomes and living standards as if material conditions trump all else. Without question, the USSR was a repressive dictatorship in which personal freedoms were severely restricted. If the end of the Soviet Union had initiated a democratising of its component republics, assessing the balance of gains and losses to the population would raise major political and moral questions. For example, is it preferable to live without personal freedom in a cage where one is adequately fed and relatively healthy, or to attempt to enjoy those freedoms in conditions of severe deprivation? The question, then, does not involve a balancing of freedom and material comfort; the question is, what has been gained? But there is no democratising trend; on the contrary, in at least half of the countries of the former USSR a new dictatorship replaced the old, often with the same cast of oppressors. The vast majority of the ex-Soviet population finds itself under authoritarian rule at a standard of living well below the level of 1990. The question, then, does not involve a balancing of freedom and material comfort; the question is, what has been gained? Life in the Soviet Union was oppressive, depressing and dangerous. Life in the post-Soviet states is, to use the phrase of Hobbes, ‘solitary, poor, nasty, brutish, and short.’ The disintegration of Ukraine reflects that reality, and is a harbinger of things to come.